Property 4: Stunningly situated holiday home in Busse to enjoy undisturbed. Property 7: Stunningly situated holiday home in Busse to enjoy undisturbed. Traditional Gite with Large Pool and Sun Terrace. Set in 16 acres. Property 38: Traditional Gite with Large Pool and Sun Terrace. Set in 16 acres. Heavenly holiday home with swimming pool and large garden. Property 39: Heavenly holiday home with swimming pool and large garden. Property 43: Welcome at Clos du mayne, farm in the quercy in the middle of forest ! French Holiday rental in the Périgord. XVIII th Century stone farmhouse. Property 47: French Holiday rental in the Périgord. XVIII th Century stone farmhouse. Ideal holiday cottage in The Dordogne on edge of pretty hamlet. Private pool. 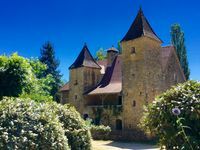 Property 48: Ideal holiday cottage in The Dordogne on edge of pretty hamlet. Private pool. Perfect in every way! Beautiful setting, house was comfortable and the hosts were first-rate. From the moment we arrived and were greeted by David in front of their 12th century manor house everything about our visit was perfect. The property was lovely and sited in a beautiful rural landscape. Our hosts were friendly and helpful, giving advice about places to eat and visit. The region is gorgeous...this is coming from people who live in one of the most beautiful villages in Maine.It was so comfortable, like visiting family, only better. Our cottage was well equipped and comfortable. David and Katie shared some products of the region with us as well as items from their garden. The geese, chickens and duck are particularly entertaining, especially while being fed our food scraps. Their children were delightful and not intrusive. The proximity to the village of Villefranche was particularly advantageous for us to be able to walk to town any time we wanted. All of the local merchants were friendly and welcoming. All in all, perfection! This was our first visit to the Dordogne region of France and we didn't want to leave. It was warm so we got to use the pool and enjoyed the back porch that overlooked the countryside. Jerry and June were great hosts. They even had fresh flowers on the table with a bottle of wine for us on our arrival. The beds were comfortable and the house was impeccably clean. All the rooms felt very spacious and the grounds were beautiful. It was a quiet retreat close to all the sights we wanted to see. It was our favorite place we stayed in France.